She told me it was YSL Baby Doll Mascara. I found myself in Sephora a few days later and picked it up. I normally don’t buy mascara that costs a lot of money, I tend to stick to the drugstore brands, with this one being my favorite. When I tried this on, I was totally amazed. I even used it without my Shu Uemura Eye Lash Curler and my lashes were huge, defined, long and curled. It completely opened up my eyes. My girlfriend even said, without a prompt to comment on my eyelashes that my eyes were sparkly today. This mascara is totally worth the hype, the only downside is that it does flake a bit, but that could be related to the fact that I’m always rubbing my eyes. Its not a bad flake and can be removed with a swipe of your finger. 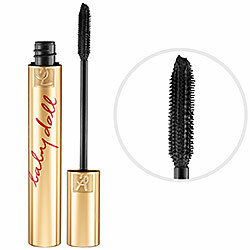 Either way I’m in love and I’ll keep shelling out the cash for this pretty perfect mascara.